Kanye West is not happy about "Coinye," a new digital currency created by anonymous coders that bears his name and face. 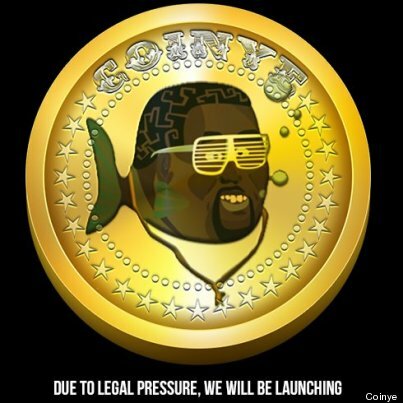 West's lawyers filed a cease-and-desist letter against Coinye's creators on Monday, arguing that the cryptocurrency represents a trademark infringement, according to the Wall Street Journal. “Given Mr. West’s wide-ranging entrepreneurial accomplishments, consumers are likely to mistakenly believe that Mr. West is the source of your services,” the document reads. "We are being attacked with fishsticks and must launch sooner. Jan 7th," the Coinye website now reads, referring to a "South Park" episode that made fun of West by repeatedly suggesting he was confused by the words "fish sticks." Coinye is just the latest of many cryptocurrencies created in the wake of the success of Bitcoin. Some are serious, but others such as Dogecoin and BBQcoin are ironic, meme-inspired jokes -- although the creators of Coinye claim to be serious about the future of their digital currency. Perhaps the coders are taking inspiration from Kanye's Grammy-nominated song, "Can't Tell Me Nothing:"
"Wait till I get my money right... then you can't tell me nothing, right."